MAIN CARD : Specially Made for Muslim/Islamic Community with Blue Color 250 gsm Shimmery Finish Paper With Raised Gold Color Printing. I liked this card very much. 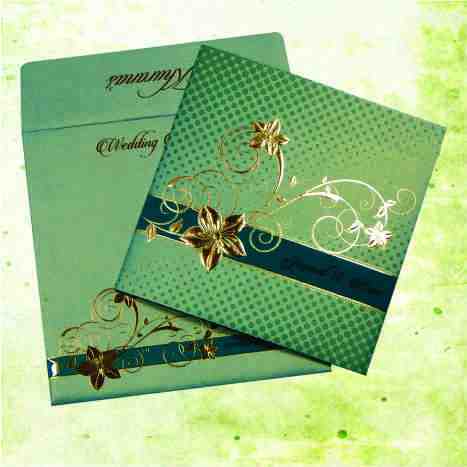 With the grace of Allah, my sister got married recently and I bought this set of invitation cards from Mr. Rahul from this website. The product is really amazing to go with. This product is great, thanks a lot Mr. Rahul. I bought this product last month, i fall in love with this card when i saw it, but first i doubt this card can be as great as its look. Then, when my card came in front of my house, i surprised and satisfied this card is truly amazing. Thanks again Mr Rahul, Hope all the best for u.